Pre- Registration is Now Closed – You will still be able to register at the door! Fee $45- Thanks for your Support of IKF Point Muay Thai / Kickboxing Sparring Tournaments! Note: We are starting the event in Homewood, AL on November 17th earlier than originally posted. ( see times Above) We originally had another event planned the day before (Nov. 16th in another state) and this is why we were starting later. However, once the other event was canceled, we felt that with the overwhelming response that we are getting for the Homewood event, that starting earlier would be best. Thanks in advance for your understanding. All the best! See you in Homewood, AL! Forward March! 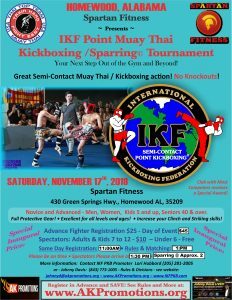 Lori and Master Cha along with Mr. Chris Connely of Spartan Fitness are inviting you their very first IKF Point Muay Thai / Kickboxing Sparring Tournament that will be held in Homewood, Alabama on Saturday, November 17th, 2018! After years of working with the Alabama Athletic Commission, we are proud to bring the first IKF Point Muay Thai / Kickboxing Sparring Tournament in the state! Men, Women and Juniors Compete for nice awards in Semi Contact Kickboxing Sparring Action! No Knockouts are allowed! Register online here or at the door! More information, contact Mrs. Lori at (205)281- 2005. Register in advance or at the door starting at 2:PM- 3:PM. Rules Meeting and Sparring to Follow. Special Priced Advance Fighter Registration Donation is only $25 – PKB 2nd Trainer and Spectator Fee is $10- Main Trainer is Free – Spectator Donation is only $10 – add $5 Credit Card service fee. Fighter Fee will go up to $35 on Monday, November 12th to Thurs. November 15th- After Thurs Night, the Registration fee will be $45 plus $5 credit card fees if applicable. All Competitors will receive an award for their participation. Register to be apart of the this special exhibition Kickboxing Sparring Tournament from Link on front page of this website. Thanks for your donations and support!